The Georgian ultranationalist, far-right, radical, group ‘Georgian March’ announces a new initiative: to create a ‘People’s Patrol’ which will monitor the actions of foreign migrants in Georgia. The post published on the Facebook Page of “Resistance” says the initiative aims at monitoring activities that may violate public order by ‘foreign illegals, criminals and terrorists’. The statement says that the patrol will be comprised of ‘young people with national consciousness’. The members of the patrol will be divided into squads of 15 people, who will walk along the streets of Tbilisi. If they come across anyone ‘suspicious’, they will detain the individual on spot and then call police. In this way, the organization hopes to help the Ministry of Internal Affairs, since the state, in their words, ‘is unable to prevent foreign criminals and terrorists from entering the country’. Sandro Bregadze, one of the leaders of “Georgian March” stated: “Together with our European friends, we have developed strategies and tactics which will be civilized, European, modern, which responds challenges of the 21st century. We fight for pure, Georgian, moral Georgia and I'm sure God will be on our side”. The majority of the population believes that the authorities should not allow the organization which constantly makes xenophobic and homophobic statements, to engage in such illegal activities. Roman Gotsiridze, member of the "United National Movement", says it reminds him of the beginning of the fascist movement in Germany. According to him, the government should not allow civilian patrols. "If such a thing happened, it means that the government is collapsing and is not capable of protecting people." - said Gotsiridze. 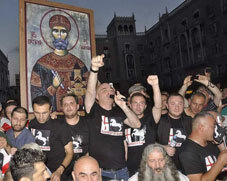 The “Georgian march” became well-known after their march along the Agmashenebeli avenue in the center of Tbilisi on July 14. The organizers of the Georgian March voiced their “official claim” to make immigration law stricter and to deport “illegal and criminal” migrants from Georgia. However, the statement made by the organizers contained clearly xenophobic demands, like: “For the Georgian Georgia”. However, there are still people in Georgia who share the ideology of “Georgian March”, who is trying to spread a fear of globalization among the population. This is not a Georgian phenomena; Many European countries are going through recent electoral gains of far-right and nationalist parties. Across the Europe, politicians with momentum are those who argue that the world is a nasty, threatening place, and that wise nations should build walls to keep it out. Such arguments have helped elect an ultranationalist government in Hungary and a Polish one that offers a mix of xenophobia and disregard for constitutional norms. Populist, authoritarian European parties of the right or left now enjoy nearly twice as much support as they did in 2000, and are in government or in a ruling coalition in nine countries. What is the way out from this situation? Journalist Eka Kvesitadze, for instance, stated she will not invite organizers of “Georgian March” to her show in order to avoid spreading ideas of these people. According to the first Vice-Speaker of the Parliament, Tamar Chugoshvili the order in the country is competence of police only. "The only institution that provides public order in the country is the Georgian police. Any other unit is totally unauthorized.. And if it all goes into illegal activities, I am sure that law enforcement officials will react. " - said Tamar Chugoshvili.